Our topic this half term is Under the Sea. During the half term holidays, children designed and made boats to share with their class. The children enjoyed exploring which materials floated, sank, and investigated how many small world people passengers the boat would hold. We read The Lighthouse Keeper's Lunch and designed and made disgusting sandwiches which included mud, sand and leaves! We all celebrated World Book Day by dressing up as our favourite book characters and sharing our favourite stories. We took part in a traditional tales quiz answering questions about familiar books. For British Science week we have been scientists, investigating a range of materials and carrying out some exciting investigations including; creating time capsules, tunnelling through sand and exploring which materials are reflective. After reading The Hungry Caterpillar we explored different shapes, sizes and textures using real fruit to making repeating patterns. We have been thinking about how amazing our brains are by making brain hats and playing memory games. The most popular experiment was making SLIME! We were very keen to mix the slime with our hands and find out what happened when more glue was added. We thought of some amazing WOW words to describe how the gooey, slimy, sticky slime felt! For poetry week we have been practising to recite our poem of the half term 'Crab' from memory. We have also been doing lots of rhyming and we even made our own rhyming octapus. We have read the poetry book Commotion in the Ocean. We made our own snorkels to visit the bottom of the sea. Our new topic is Once upon a time... We are reading lots of traditional tales including Little Red Riding Hood, Goldilocks and the Three Bears and The Gingerbread Man. As part of our holiday homework, we made puppets of our favourite fairy tale characters. In class we used our puppets to retell our favourite fairy tale stories. Our teachers acted out the story of Little Red Riding Hood, we joined in repeated phrases from the book. We used masks and costumes to retell the story in class. This week we have been learning all about Goldilocks and the Three Bears. The Hobgoblin Theatre Company visited to show us their production of Goldilocks. What a wonderful time we had! We joined in and had lots of fun. This week we read the story of The Little Red Hen. The children talked about helping their friends. The Living Eggs Project visited school. The children learnt abut life cycles by watching the eggs hatch into chicks. We looked after them by feeding them, giving them water, cleaning their bedding and giving them lots of love. The children made the chicks good bye cards when it was time to go back to the farm. Congratulations to the children and parents who attended reading and phonics club in the spring term. 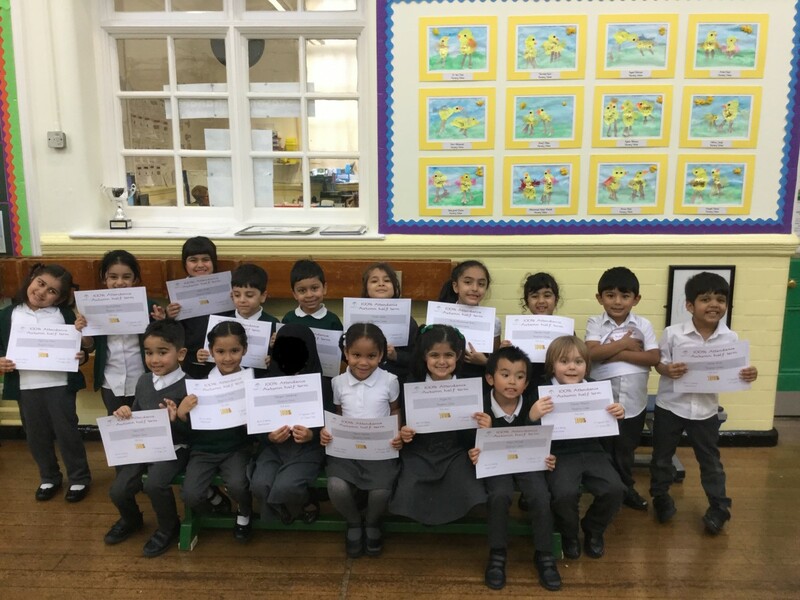 The children were award certificates for their attendance and good work. This week we have enjoyed celebrating the Chinese New Year. We made rice noodles and they tasted delicious. It was a bit tricky using the chop sticks but we tried our best! What a busy week in Reception! Not only have we celebrated New Year but we have explored the great outdoors at Forest School. We searched for insects and bugs and had great fun making bog art using clay, twigs and leaves. Some of us also used the hammers to knock stakes in to the ground! This week we have started our new topic On the High Street. The children have enjoyed exploring our new Doctors Surgery role play areas in the classrooms. We have also had a busy week celebrating Bonfire Night and Diwali. The children created beautiful firework marble paintings. They decorated our house outdoors for Diwali and role played celebrating. Each child also made their very own diva using clay. Reception children raised money for Children in Need by dressing in spots and making Pudsey Bear masks and pictures. As part of our friendship week, we role-play looking after each other in our role-play doctor’s surgery. We read the story ‘Owl Babies’ and role-played the story with puppets and mask. We thought about how the baby owls were feeling and made pictures. We wrote about the beginning, middle and end of the story. In mathematics, we counted worms, insects and mice for the owls to eat. We have been learning about dental hygiene and healthy eating. We wrote instructions to remind our friends how to brush their teeth. We timed ourselves brushing our teeth for two minutes and discussed the importance of brushing our teeth twice a day. “it’s better to drink water because it doesn’t rot your teeth” Sahajpreet. “if you have sugar you have to brush your teeth” Ayaat. Congratulations to these 10 children who have been awarded their phase 2 reading badges. This week we had our exciting visit to Severn Valley Railway station. We had a fantastic day riding a steam train, meeting Father Christmas and receiving some lovely gifts. The children have been exploring their new classrooms and making new friendships. At the end of the week the children took home their Grove book bags to share stories at home with their families and a copy of their name card to practise forming the letters in their name correctly. This week the children attended Reception full time and stayed for lunch. They were particularly excited on Friday for pizza and chips. The children have also been working hard with their reading and writing. This week the children have put on their waterproofs and their warm coats and have explored the outdoor environment. They have experimented with construction materials to make homes for their pets and even a digger to make the homes! Painting in the outdoor was a huge hit with the children as they mixed their colours and painted outdoor friezes. The school theme of the week is Road Safety. 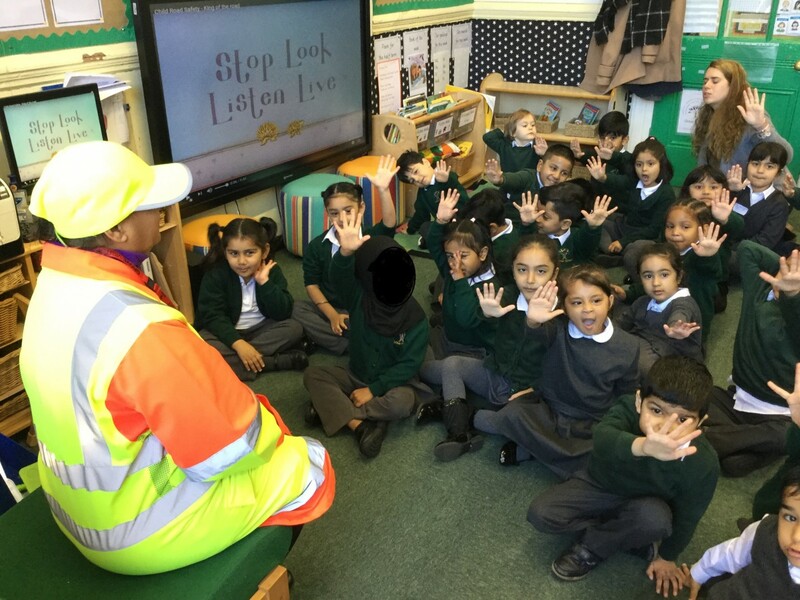 Reception had a special visit from the school Lollypop person who talked to us about crossing the road safely. Outdoor we role-played crossing the road safely using a zebra crossing. We learnt the song 'King of the Road' and made posters for homework reminding us to.. STOP, LOOK and LISTEN! We have had a very exciting week. On Tuesday we met Mo, the Animal Man. He showed us a real life snake, hen, chameleon, rabbit, cockroach and tarantula. The children were extremely brave and stroked and held the animals. Thank you to all the families who joined reception during parents evening and our reading and phonics workshops. Children showed off their skills in segmenting and blending CVC words such as h-a-t.
Staff modelled using the online reading resource, bug club. We hope the children in reception enjoy reading online books at home. Congratulations to the children who read their school book at home and changed their reading book bags in school every week during the first half of the autumn term. These children were awarded certificates in assembly. Congratulations to the 48 children in reception who came to school every day in the first half of the autumn term. Children with 100% attendance were awarded certificates and book marks.